I got there before it opened for the day, and the line snaked out the door, along the side wall. There were charter busloads of people getting out, dressed up pretty fancy for a day at the museum. One bus said “Green” and I thought it was named after the museum founder, chair and primary funder, as well as Hobby Lobby president Steve Green. Only the next bus was “Blue” so there went that theory. I had about three hours to spend in the museum, which was not enough time. I didn’t see everything. You could easily spend another few hours there – plus eat in what looked like a great restaurant. 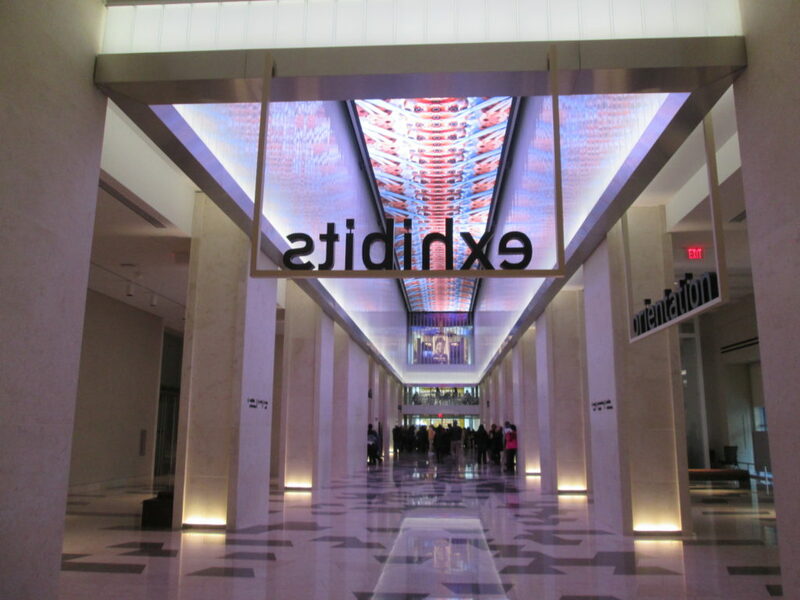 Toward the end, I rushed through a few of the exhibits just to have glanced at them, and skipped a few of the longer “experiences” that were either multimedia or experiential. 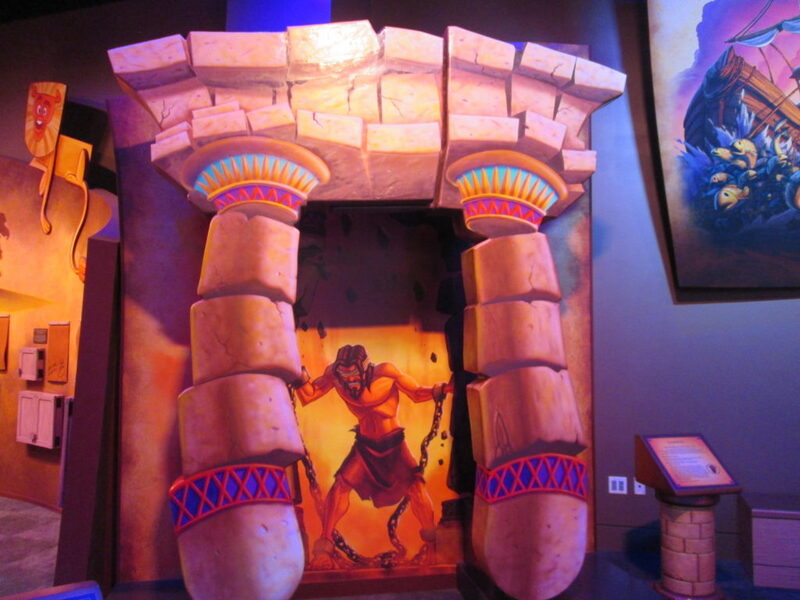 Should you go to the Museum of the Bible with kids? It depends. The museum is BEAUTIFUL. It’s high tech. They use a ton of videos to tell stories and explain things in a variety of ways. Not all the museum is child friendly, but there are many many parts that kids will enjoy and things for them to touch, see and do. And while It’s founded by an evangelical Christian, it did not feel right wing nor like it was trying to convert anyone. It also stayed away from controversial topics in religion, like homosexuality, though it did address slavery and its role in the bible. Bible scholars and those who have more strongly held/scholarly views can find some controversial subjects to talk about here, but that’s not me. Here’s a longer version of what you’ll see at the museum. After walking in and going through security and the tickets window (more on that at the bottom), you’ll enter a long hallway. Look up. The ceiling has a long long line of LED panels flashing interesting designs. Is there a bible connection there? I didn’t see one, but I read somewhere that the screen sometimes shows movies and scripture quotes. On the right, there’s a coat check (and I checked a small suitcase – no fee). Then the gift shop (more on that later). On the left you’ll eventually be able to get some electronic devices to guide you through, but those weren’t ready as the museum was so new. Though there’s a basement level with exhibits, head to the elevators to start at the top. The elevators are amazing as well. 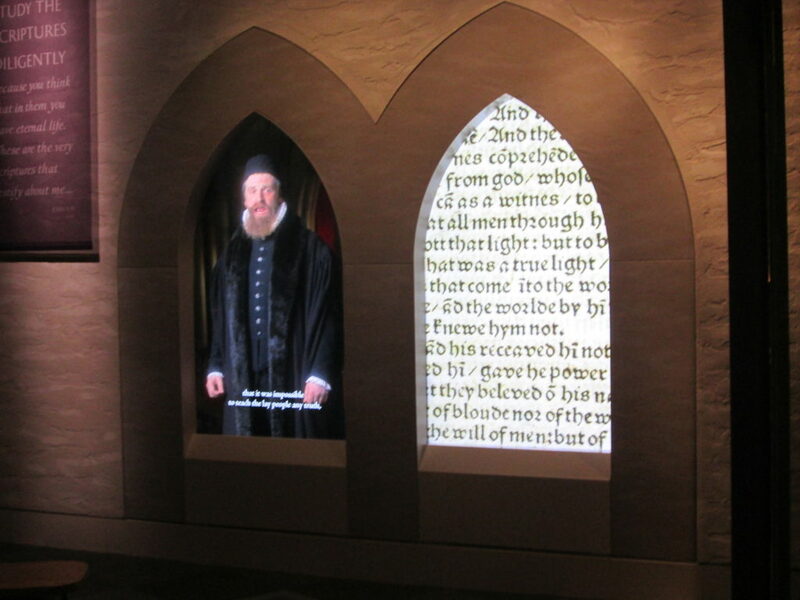 Inside there are three video panels with scenery. Butterflies flit around and you may even see a hummingbird. 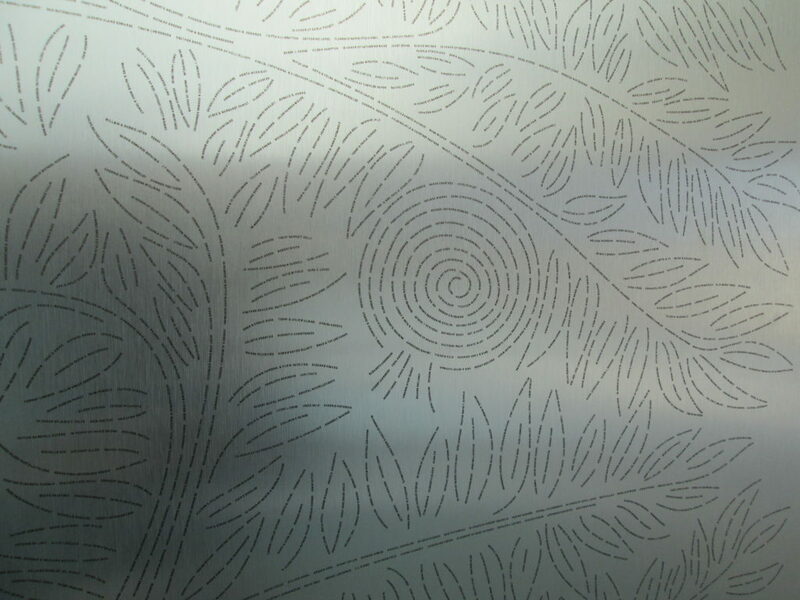 I wanted to spend more time in the elevators looking at the panels. 6th floor: With kids, you’ll probably just want to see the overlook view and the restaurant. 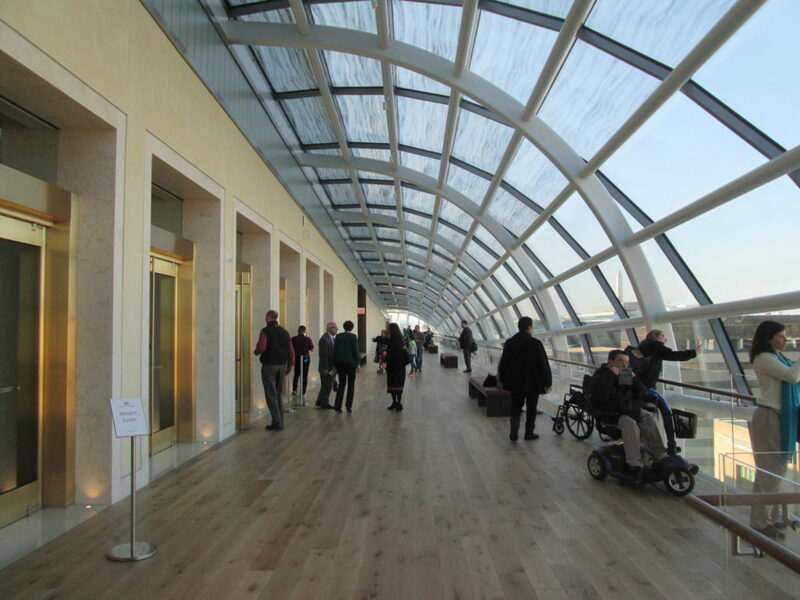 They have a glass topped walkway, the Promenade, with some nice views of the DC skyline, including the Capitol and the Washington Monument. In the atrium area, look on the walls for the panels showing financial contributions to the museum. They’re done in microcaligraphy to resemble pomegranates and nature scenes. Microcaligraphy is popular in Israel, especially in the town of Sfat. As it sounds, microcalligraphy is written words that are very small, and they form art work. The 6th floor also houses the restaurant Manna, and a “biblical garden” which seemed more like an outdoor eating area with a water feature. The restaurant looks delicious – more on that in the next blog post. 5th floor: The fifth floor had two exhibit areas in the promenade hallway. 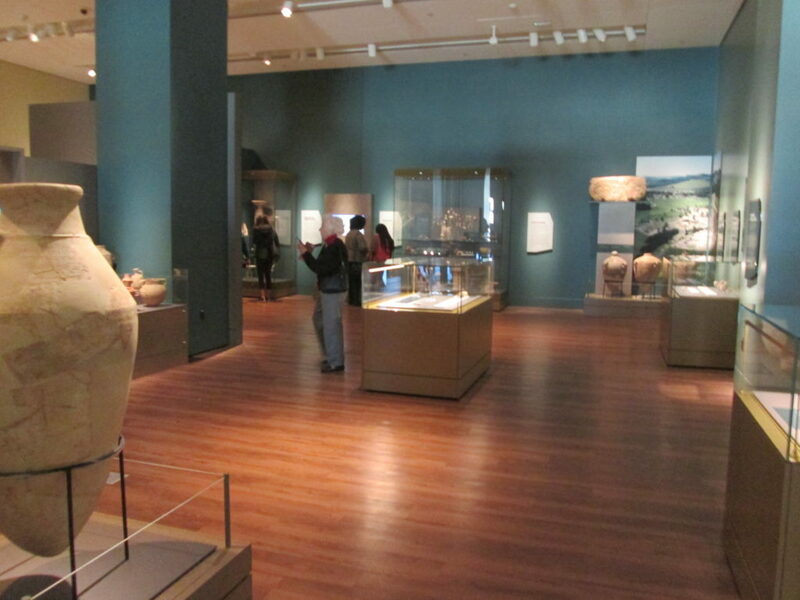 One is on Israeli antiquities and is fully organized by the Israeli Antiquities Authority. They have a movie in there kids may like, but it might be boring for them otherwise. The other exhibit is temporary, currently containing two exhibits relating to artwork on biblical themes. 4th floor: This is the History of the Bible section. The word bible is basically the English word for “the books” – a compilation of scriptural writings. A very large portion of the floor is dedicated to the walk through time from pre-bible writings, to the Torah (the Jewish sacred scrolls containing the first five books of the bible), to the Jewish canon, to the Christian bible. 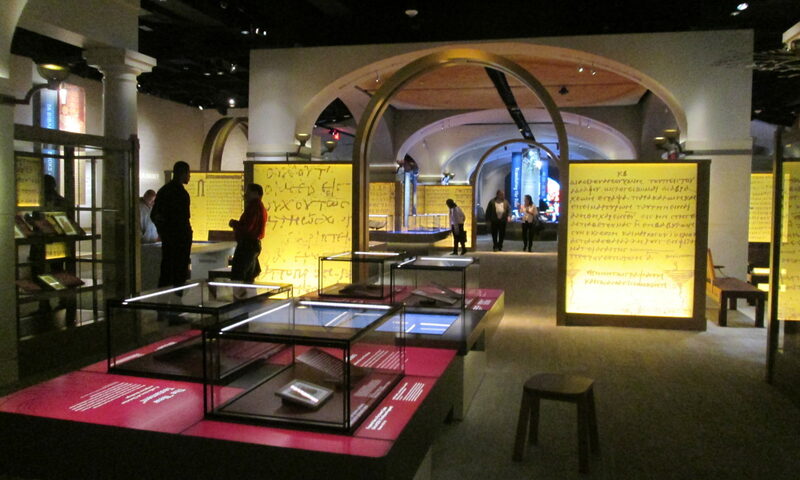 The exhibit shows the spread of the Christian bible through the world, and the role of translations. There’s a breakdown of different Christian denominations, and what books each of those bibles includes, which is interesting. There is an incredible number of bibles contained here – all dates, some illuminated and gorgeous, some small and very worn. The kids will enjoy the movies here as well, explaining historical points, as they’re lively and entertaining. The bibles themselves are probably not going to be a big draw for the kids (or anyone who isn’t a bible scholar). 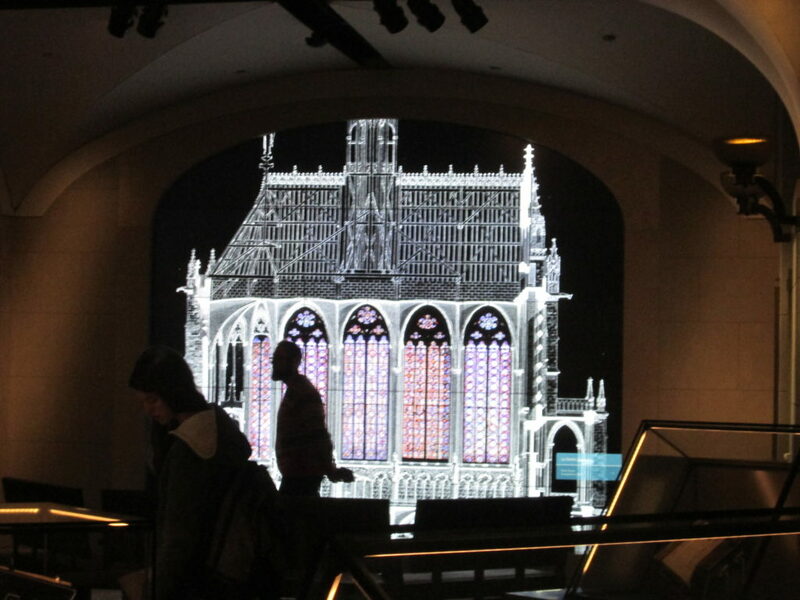 There’s a lot of eye candy and interactive features including a changing stained glass church section which is electronic (and big – see example in photo above), some historic translators talking in a frame like you’d see in Harry Potter movies/books (see photo below), and a section where you learn how a bible is printed and bound (you can touch). They also have a huge section of Torahs, and a sofer (Torah scribe) is sometimes present to show how the hand inscribing works. This whole exhibit floor was louder than I’d like, as there was so much audio, I had a hard time focusing when reading the exhibit signs. 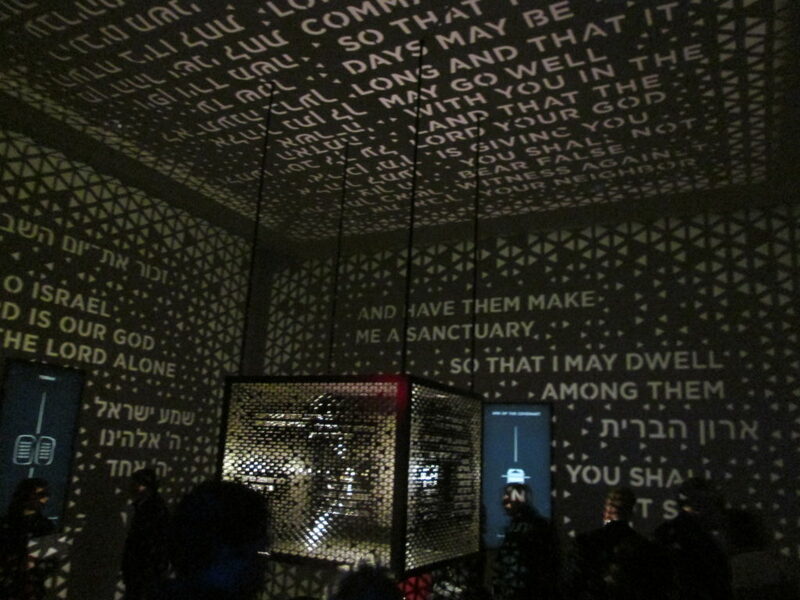 Also on the 4th floor is the IllumiNations area, featuring bibles translated into many languages spoke in the world. You can see with color coding which languages currently do not have bibles translated into those languages. If you were wondering, there are 1,525 languages with translated New Testaments. IllumiNations (an alliance of bible agencies) has a goal is to “eradicate bible poverty” by 2033. This floor also has another video you can pay to watch – featuring the same dude in the other videos. I know nothing about it, and it wasn’t yet open when I visited. It’s called Drive Through History. 3rd floor: This is probably going to be the best floor for the kids. It’s Stories of the Bible. I got in the Hebrew Bible queue, not realizing it was more than a quick movie. 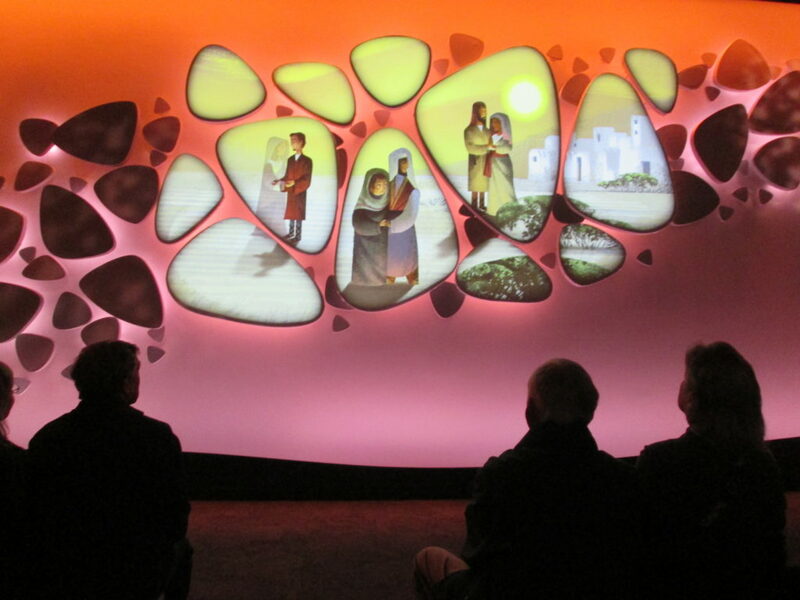 It’s a walk through multi-media experience, and it takes 45 minutesI It tells some of the stories from Genesis through Deuteronomy. Note that it can be a little scary! I kept my eyes on three young kids (probably all kindergarten and younger) throughout the experience. 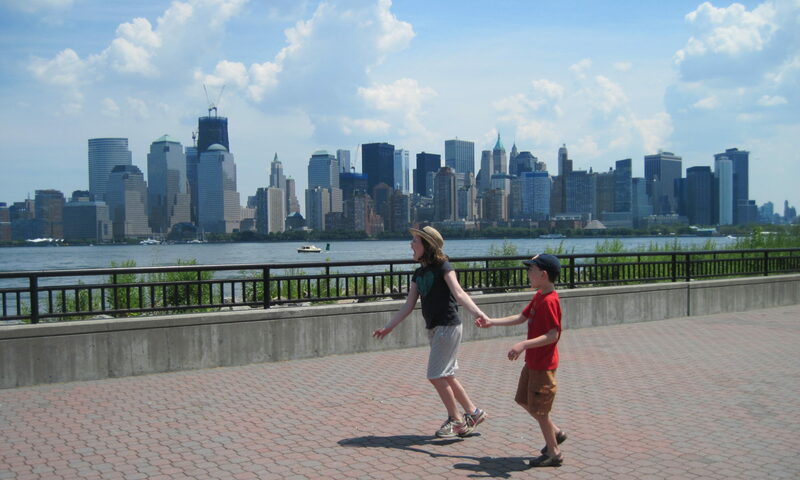 They didn’t look scared, per se, but they did cling to their parents. There’s a fair amount of darkness, noise and even some smoke. You move from room to room for the different stories, and it’s quite an experience – high tech and creative. Also on this floor is the World of Jesus of Nazareth. 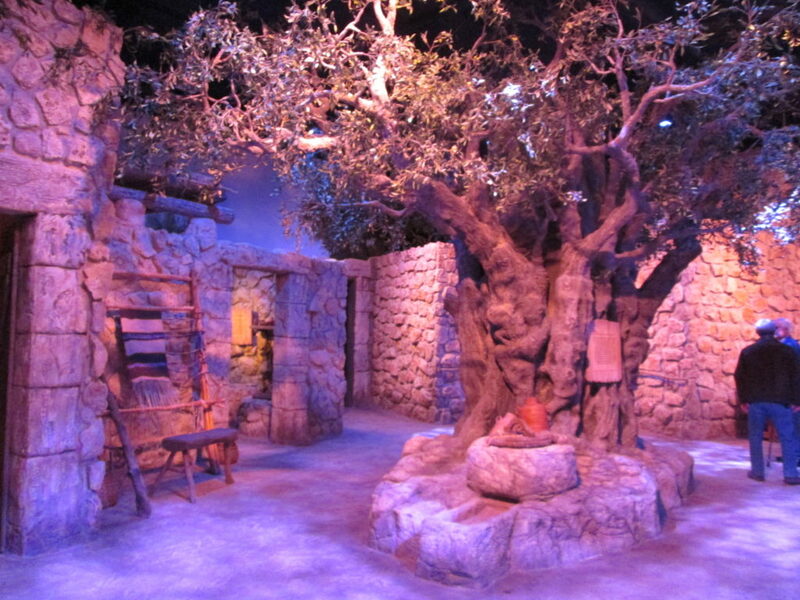 You walk through a faux Disneyesque Nazareth, complete with plastic pools of grapes turned into wine, an olive press, a typical home with food on the table, a ritual bath (mikvah), etc. 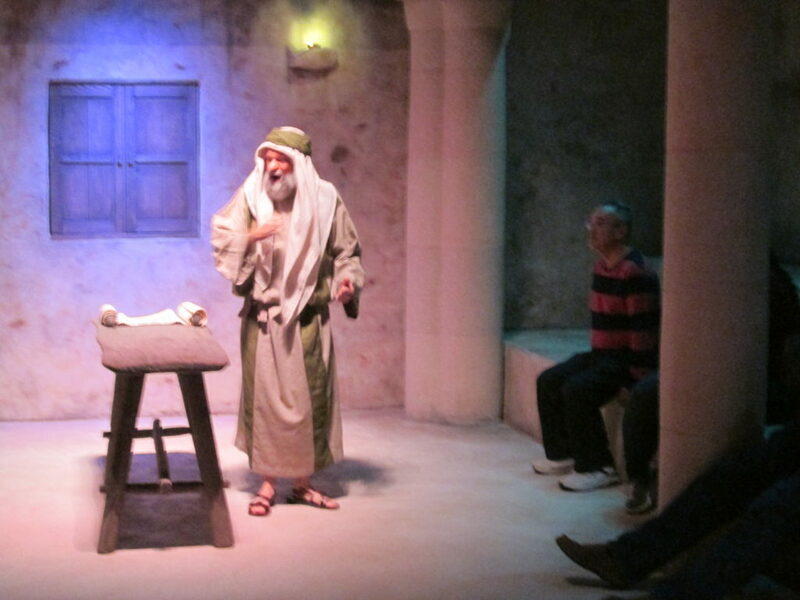 There were several actors telling about life in Nazareth. One was in the synagogue telling about the local temple in Jesus’ time. Another talked about home building and the tools used. It was interesting but very plastic looking. 2nd floor: This floor is the Impact of the Bible. It might be interesting to some kids. The exhibit covers the bible in America, telling about the bible’s influences on slavery (used for and against arguments of slavery), a reproduction of the Liberty Bell, which has a biblical phrase on it, how the forefathers used the bible when creating the constitution, the bible’s influence on calendars and time calculations, the depiction of the bible in mass media, science and the bible in society, the bible’s influence on music, the bible in literature, etc. 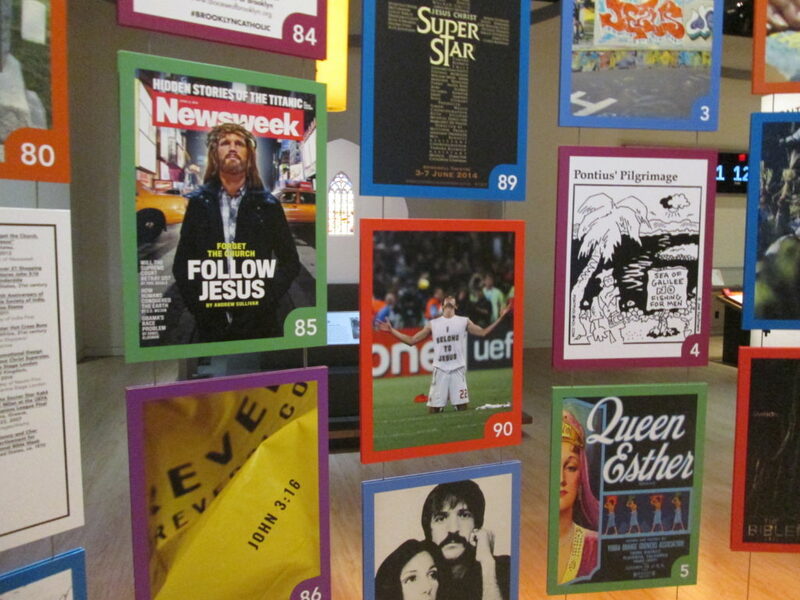 Part of this section shows fashions using the bible. 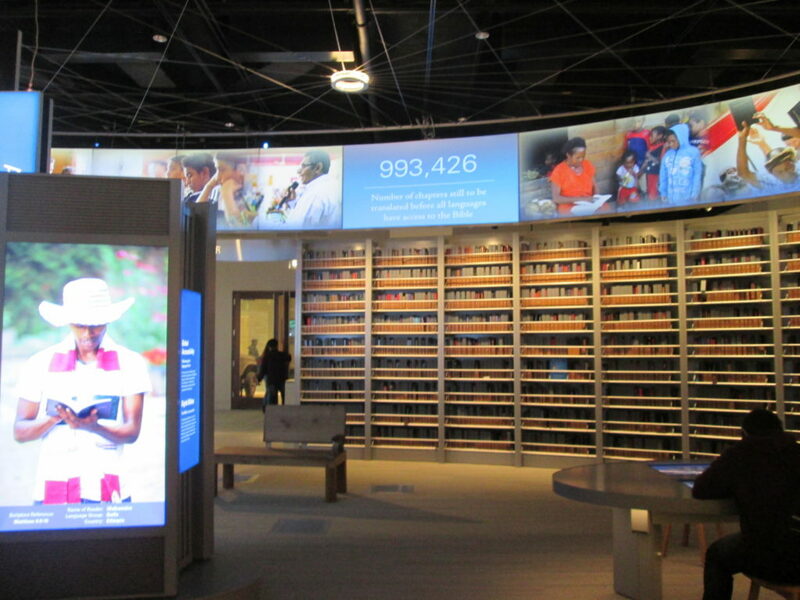 There are some interactive features as well, like using a big computer table to look up your name and its biblical origins, and another to take a bible quiz. Also on this floor is a ride called Washington Revelations. It takes you to various Washington DC landmarks to show you biblical references on the buildings. I didn’t have time to try this out. 1st floor: As mentioned earlier, this is the lobby floor. 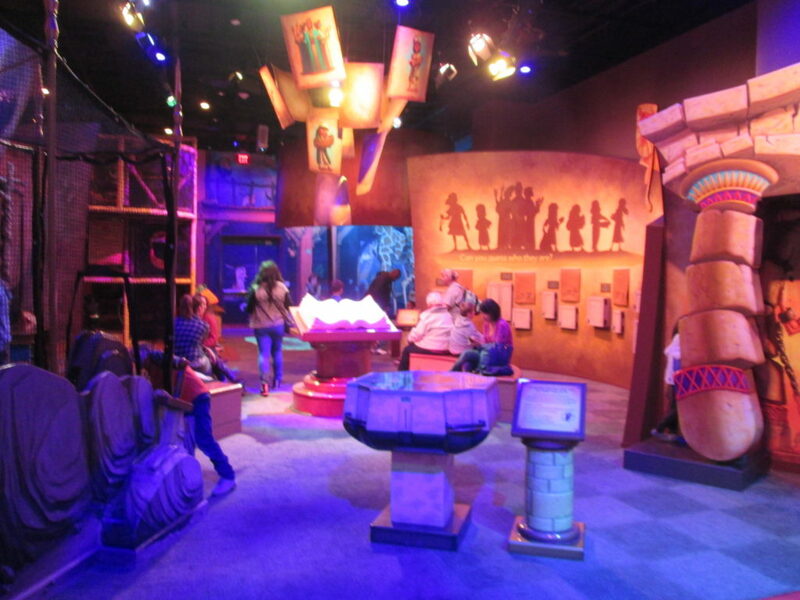 The highlight for kids is the Children’s Gallery, a bible-themed play area. You’ll be introduced to Pages the Lion. When the electronic devices are working, the kids can get narration/guided by Pages in age-appropriate speech, while adults get the adult version. In the play area, there are hands-on games like “Esther to the King” where you guide a ball or something along a twisty road. There’s a David and Goliath ball game where throw balls at Goliath’s head (!! ), and another where you throw balls into lions’ mouths. There’s also a climbing structure, and a Noah’s Ark with plastic Little People (just like we had for our kids!). Basement: Not much that’s kid-friendly in the basement currently. There was a sculpture exhibit on Jesus at the stations of the cross by one artist. The exhibit I really liked in the basement was Amazing Grace (not the Broadway-bound musical, which you can also get tickets for through part of January at their 400+ person theater). 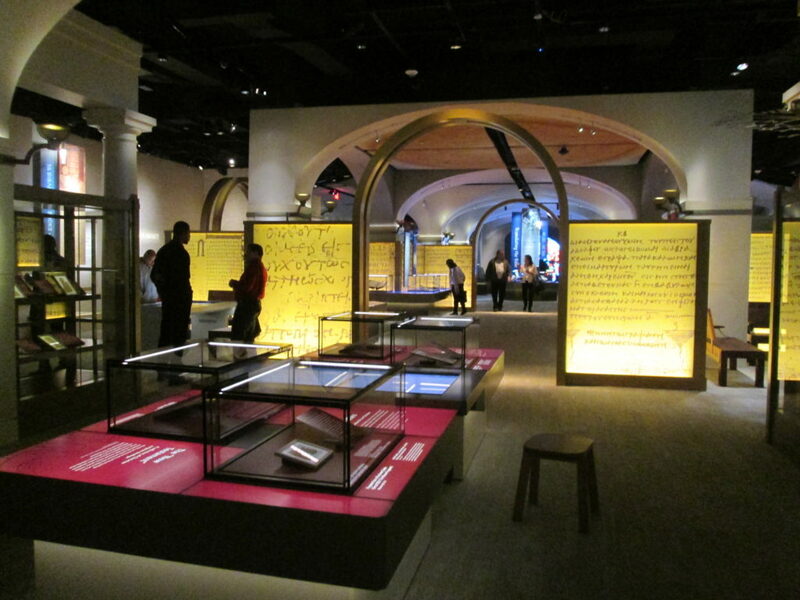 The exhibit follows the writing of the the Christian hymn from 1779, and the author’s history. It goes through modern interpretations of it in music, and how it rose to prominence through the gospels. Unfortunately I had to run through this exhibit since I was out of time and had to leave for my lunch meeting. The museum had a few other temporary exhibits I didn’t see. As mentioned, it’s a big place. Should you take the kids? It depends on you. Reading through this, figure out if it sounds like a museum that would interest you and your kids. As someone who is Jewish, I still found it interesting from a cultural and historic point of view. 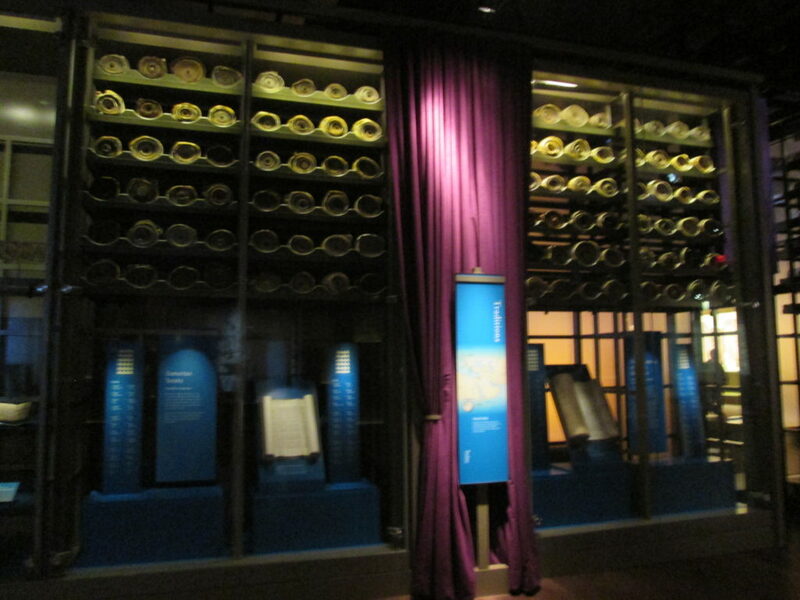 A lot of the museum revolves around Christianity, so that may be of interest, or may not. It was not offensive or preachy, which I appreciated. 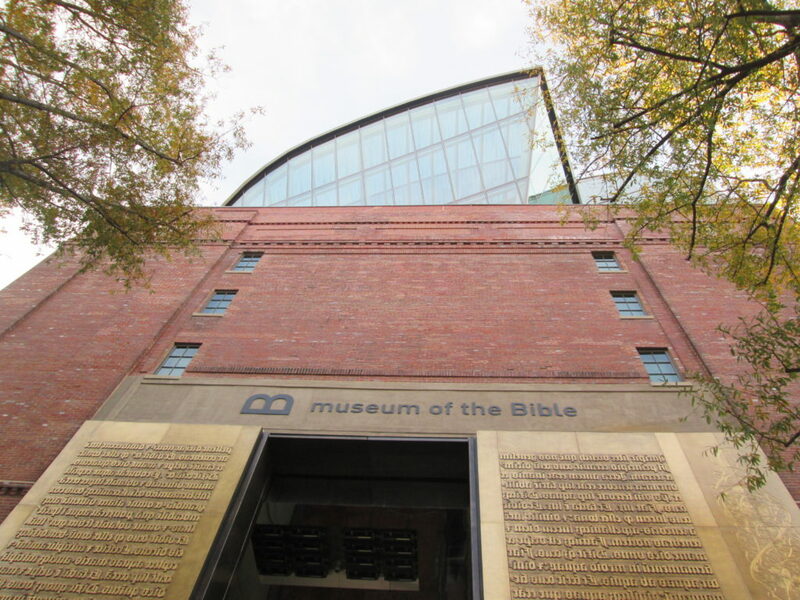 Part 2 of the Museum of the Bible review will focus on the controversy surrounding the Museum of the Bible, getting tickets, the gift shop and the restaurants. Disclosure: I had a press ticket to review the museum. All opinions are my own. The museum has a suggested donation but does not require payment to attend.